Salihu Tanko Yakasai, Kano: Governor Abdullahi Umar Ganduje of Kano state today presented an appropriation bill of N209, 857,330,488 for the 2017 fiscal year to the state House of Assembly for ratification. Tagged “Sustainable Self Reliance” budget, it consists of N 130,486,682,677 for capital expenditure while the sum of N79, 370,647,811 is for recurrent undertakings. “The proposed capital expenditure for the 2017 fiscal year is N130,486,682,677 which is less than that of 2016 by N59,861,393,873 and it is to be financed by N64,329,872,216 expected Recurrent revenue surplus and total capital receipts of N66,156,810,461”, Governor Ganduje explained. According to the governor, the Capital Receipt is made up of N7,190,528,060 expected Internal and External loans drawdown, N26,202,301,276 estimated Grants, N32,563,981,125 Miscellaneous receipts and Treasury opening balance of N200 million. The total projected Recurrent Revenue for the year is estimated at the sum of N143,700,520,027 which consist of N46,010,415,132 Internally Generated Revenue (IGR) and N97,690,104,895 Revenue from the Federation Account (FAAC). Gov. Ganduje explained that the total recurrent revenue is higher than that of year 2016 by N774, 385,794 representing 0.79%”, adding that the projected Internally Generated Revenue (IGR) is lower than that of year 2016 by N13, 215,199,074 representing 8.4% increase highlighting that the decrease is based on the current economic realities in the country. 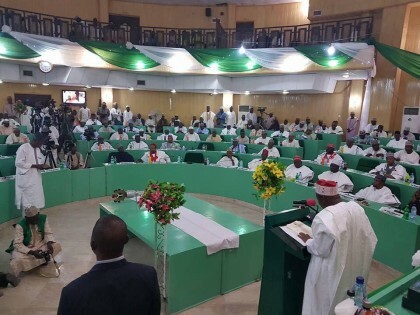 Further breakdown of the budget, as given by Ganduje, shows that the Public works and housing sector got the lion share, receiving an allocation of N43.72 billion for construction of several municipality and urban roads, bridges, a modern abattoir in Kano city, completion of some underpass roads and commencement of the city light rail project, among others. Education got the second largest share of N17. 5 billion, Land and Physical Planning, N16. 8 billion, Water Resources has N13. 5 billion, even as Health got an allocation of N10. 74 billion. In the same vein, N6.6 billion was earmarked to the various Agricultural programs and projects in the state, Environmental protection was allocated N1.7 billion, Commerce and manufacturing, N1.7 billion, while N1.25 billion was set aside for Information and Sports. Other sectors such as Women Affairs and Social development and the state Judiciary were allocated the sums of N854 million and N702 million respectively. Responding, the Speaker of the state House of Assembly, Alhaji Kabiru Alhasan Rurum pledged to organize public hearing on the bill to seek input of the people, assuring it will be granted expeditious passage.